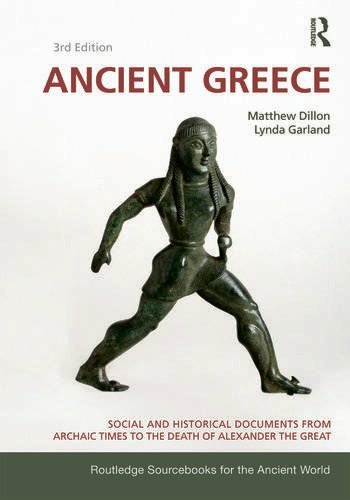 In this revised edition, Matthew Dillon and Lynda Garland have expanded the chronological range of Ancient Greece to include the Greek world of the fourth century. The sourcebook now ranges from the first lines of Greek literature to the death of Alexander the Great, covering all of the main historical periods and social phenomena of ancient Greece. The material is taken from a variety of sources: historians, inscriptions, graffiti, law codes, epitaphs, decrees, drama and poetry. It includes the major literary authors, but also covers a wide selection of writers, including many non-Athenian authors. Whilst focusing on the main cities of ancient Greece - Athens and Sparta- the sourcebook also draws on a wide range of material concerning the Greeks in Egypt, Italy, Sicily, Asia Minor and the Black Sea. Ancient Greece: Social and Historical Documents from Archaic Times to the Death of Alexander the Great. Third Edition, will continue to be a definitive collection of source material on the society and culture of the Greeks.